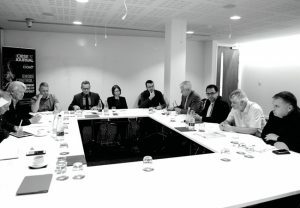 CIBSE round table: Smoke control, are the current regulations fit for purpose. As technical Director of Fire and Smoke Solutions (FASS) I was asked to represent the Smoke Control Association at the recent CIBSE Round Table, flagged by Dame Judith Hackitt to discuss key issues around smoke control regulation after Grenfell “Smoke control: are the current regulations fit for purpose?” held at the Royal Pharmaceutical Society in September. An in depth debate and sharing of views experience by delegates attending was had on the key issues surrounding smoke control that are currently dominating our industry. The biggest message arising was the need to preserve “The golden thread” that must run through all building projects to ensure the original fire and smoke-control strategy is preserved throughout the life of the building. The importance of using qualified and competent engineers to design in appropriate solutions at the start, and then to ensure that they are correctly installed and commissioned before being correctly maintained over the life of the building was universally agreed. Other members included Conor Logan, technical director, Colt; Nick Troth, chartered fire engineer and associate director, Arup; Chris Hallam, technical director of fire engineering, Hoare Lea; David Quinn, group director, fire engineering, BuroHappold Engineering; George Adams, engineering director, Spie UK; Dr Ahmed Allam, director, Cundall Fire Engineering; Hywel Davies, technical director at CIBSE; Dr Roger Harrison, technical director of fire safety, BRE Global; Alex Smith, chair and editor, CIBSE Journal. NOW CERTIFIED AS AN – SCA IFC SDI 19 Certified Company.